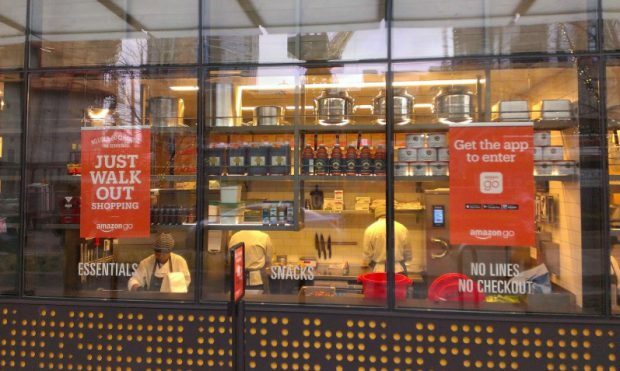 IGD Research visited the Amazon Go concept in Seattle to review the technology and core proposition. Here are their initial thoughts on the format, as reported in this week’s aacs.org.au newsletter. As expected, the store was seeing heavy trade on its second day of operation. While the long lines outside the store had diminished, there continued to be a strong level of interest, with local residents, city workers and tourists at the store during our time of visit. Having downloaded the Amazon Go app, which is linked to a customer’s Amazon account, access to the store was easy and straightforward; the glass gates are opened by scanning the QR code which is generated within the app at one of the barriers at the store entrance. While the technology, and its ability to track what each customer is purchasing, is impressive, one of the standout features is the quality of the convenience-led proposition. With a focus on eat-now and eat-later ranges, Amazon has built an impressive offer for its debut into the channel. The front of the store is dominated by a wall of wraps, sandwiches, salads and bowls, the majority of which are prepared on-site. While the prep areas are not open to customer view from inside the store, as has become more common within grocery stores over recent years, they can be seen from the outside of the store, reinforcing the retailer’s freshness credentials. While the store’s own ranges dominate the eat-now offer, the top-up grocery ranges consist mainly of national brands. A good level of choice is available in most categories given the 167 SQ M footprint. Several of Amazon’s private brand ranges are present, including a selection of Whole Foods Market’s 365 Everyday Value range, a small number of Wickedly Prime products and its meal kits offer. The technology, including a mix of sensors, cameras and artificial intelligence, is unobtrusive. Unless you are looking for it, it would be difficult to spot. Three products were purchased as part of our visit, and an accurate notification detailing the final total was sent via the app around 10 minutes after exiting the barriers. The store provides a small seating area, which also includes microwaves and charging sockets. Our first impression is that Amazon Go is an excellent convenience format. The technology worked flawlessly, even if it felt unnatural to walk out without physically paying or having any form of interaction with store staff at the end of the visit. The balance of the offer is excellent; the fresh food ranges which include a significant number of healthy eating product choices, are impressive. A high degree of thought and planning sits behind the grocery top-up offer. Along with the contemporary store design, this store would have strong appeal in any urban setting. While this initial store will provide Amazon with learnings in terms of the technology and offer development, there are likely to be further test stores before any decision is made on a wider roll-out. The amount of technology, and its associated cost, required in each store, is likely to be a challenge, particularly given the relatively low basket spend within a convenience store. However, as a marketing tool, and helping to raise brand awareness, this store has probably already provided a return on the investment. By Stewart Samuel, Program Director, IGD Canada.